-Never buy a puppy from a breeder, who has always puppies for sale! -Never buy a puppy without papers! You have to get pedigree, pet passport or vaccine book, microchip and at least one vaccine (preferred to have 2) before the puppy left the breeder at the age of 8 weeks! -Parents must have tested for hips! Now we test for elbows and OCD as well! If all dogs has A result, be careful, it is impossible to breed only dogs with A hips. A,B or C result is even very good. -Parents are tested for or have clear by parentage result for TNS, NCl and CEA is a MUST! -More DNA tests are available and suggested before breeding like: MDR1 (multi drug sensitivity), SN and IGS-altough not too much border collies are affected, a stud dog should be tested. -Be careful with glaucoma. It is sadly well known in border collies. We do not know too much about this illness, it can be primary and secondary from, can be inherited. The OptiGen CL test is a DNA-based test that provides a method to identify the Border Collie neuronal ceroid lipofuscinosis disease gene, commonly referred to as CL, inherited as a recessive genetic defect. This test allows you to control the CL gene frequency in your line so you can prevent producing puppies affected with the disease. Among lines of Australian descent, it is estimated that up to 3% of Border Collies are carriers and about 1 in 1000 matings will produce affected pups. Neuronal ceroid lipofuscinosis is a type of lysosomal storage disorder that results in accumulation of lysosomal storage bodies in the cells of many tissues of the affected animal. This leads to progressive neurodegeneration (degeneration of brain and eye cells) and results in severe neurological impairment and early death. Affected dogs appear normal at birth, but begin to exhibit symptoms early in life – around 1- 2 years of age. The age of onset and severity of the disease can vary greatly among individuals. The symptoms include progressive motor decline with seizures and loss of coordinated muscle movements, cognitive decline and abnormal behavior. Visual impairment may occur. 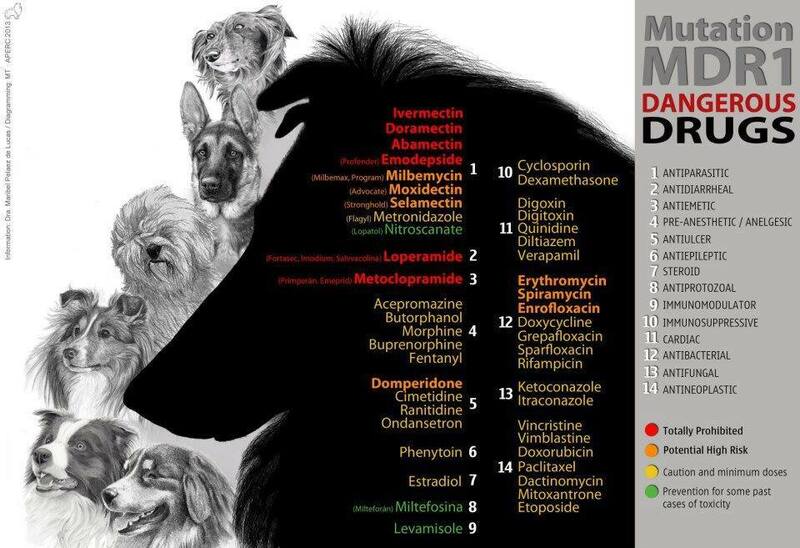 Due to the severity of the disease, affected Border Collies rarely survive beyond 26-28 months. There is no treatment or cure at this time. TNS stands for Trapped Neutrophil Syndrome, an hereditary disease where the bone marrow produces neutrophils (white cells) but is unable to effectively release them into the bloodstream. Affected puppies have an impaired immune system and will eventually die from infections they cannot fight. Once thought to be rare, it is now believed that the disease goes undiagnosed for several reasons. First, not very many veterinarians know about the disease to look for it. Second, even when looking, blood counts do not always show lower than normal neutrophil (white blood cell) counts. Finally, because it is an autoimmune-deficiency disease, young puppies present a variety of symptoms depending upon what infections they fall prone to. Thus many cases are not properly diagnosed and have just been thought to be "fading puppies". Making the diagnosis even more difficult is the fact that age of onset varies depending on which infection is involved at the time. Most puppies become ill before leaving the breeder but some do not have symptoms until later. The oldest known survivor was 2 years 8 months. Most affected puppies die or are euthanized by about 4 months of age. The research now suggests that the gene is widespread throughout the Border Collie breed. TNS cases have been positively diagnosed in Australia, Great Britain, Hungary, the Netherlands, New Zealand, and the United States. TNS carriers have been identified in lines not related to the Australian and New Zealand lines where the disease was first identified - including 100% ISDS lines. It is autosomal recessive, which means that both parents have to be carriers to produce an affected puppy. At this point in time, no one knows exactly what causes dog hip dysplasia, but most vets now agree that dog hip dysplasia is probably an inherited condition. They also agree that the dog hip dysplasia probably isn't influenced by a dog's diet, although dog hip dysplasia is aggravated by excessive weight and obesity problems. They suspect that the animal's overall weight and/or very rapid growth during puppyhood may be contributing factors for dog hip dysplasia. We can strengten the joint and sinew by feeding extra C vitamin. The extra dosis Ca is very dangerous too, becasue the less Ca can be utilized in 100%, but the redundant Ca phases out phosfor from the body.